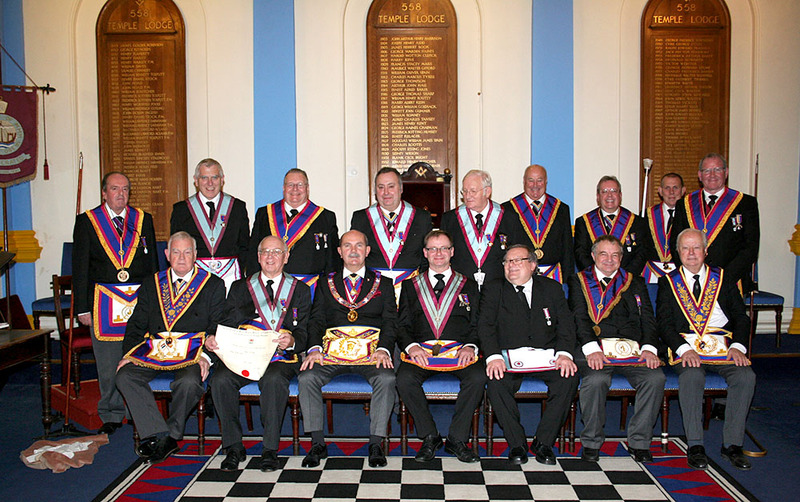 The Brethren of Folkestone Mark were honoured to welcome the PGM, R.W.Bro. Archie Torrance to their regular meeting on Tuesday 17th November 2015. It was a very full agenda with the Advancement of Bro. Mike Goulding followed by the presentation of a certificate for 50 years service to Bro. Hudson Dixon. After the Certificate presentation the PGM gave a field promotion of Past Provincial Grand Senior Deacon to Bro. Hudson and this was the first Field Promotion witnessed in the Lodge. The Lodge was very pleasantly surprised and even Bro. Hudson uncharacteristically speechless! Our hard-working PGM then presented a Grand Lodge certificate to Bro. Mark Hughes. The acting W.M., W.Bro. Jeff Powney was able to present a cheque from his recent Ladies Night to the PGM which took the Lodge to 53% of its target for a Bronze Award in the 2020 Festival. A very convivial Festive Board was enjoyed by all and the PGM went home with a large bouquet of flowers for Maggie which he later told the Lodge Secretary was much appreciated and had helped to brighten the house. The photograph shows Bro. Hudson proudly displaying his 50 year Certificate together with the PGM, Lodge Members and Guests.